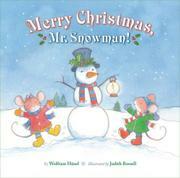 A pair of mouse siblings, Pip and Squeak, work together to build a snowman in this sweet but slight holiday offering, first published in Switzerland. Pip and his sister build a large, traditional snowman near their house and then decide the snowman might be lonely or might catch cold (get it?) outside on a hill all alone. The little mice fetch their sturdy sleigh and surreptitiously haul the snowman into the house, hiding him behind the tree. Daddy and Mommy Mouse intervene and reinstall the snowman outside the house, looking in the window, where he inspires an outdoor Christmas Eve celebration that draws in the whole neighborhood. Soft-focus watercolor-and-pencil illustrations show the cozy anthropomorphic world of the mouse family, with patchwork armchairs and a candle-lit Christmas tree. The mice wear charming clothing, especially the little ones dressed in warm coats, mittens and snow boots. One illustration fails to match the text, which specifically mentions the children’s present for their parents: a cat-shaped nutcracker. Observant children will search among the gifts shown in that spread for the nutcracker, which is nowhere to be seen.